Saturday was “Midsummer”. It’s the Saturday after the first day of summer and a day to celebrate all the wonderful things about a summer evening! So we’re having dinner al fresco among the flowers and fireflies. I love to entertain outdoors on the patio. 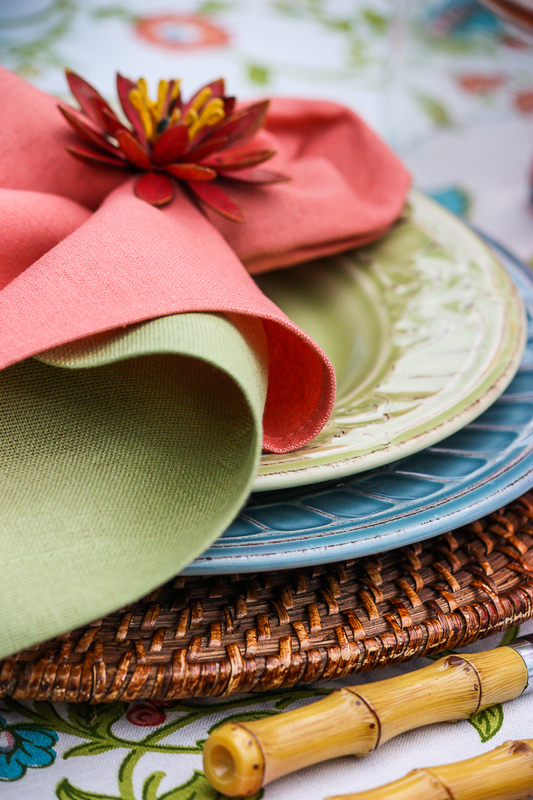 Here are a few tips for making your summer dining something special! Today on our podcast Decorating Tips And Tricks we are talking about BATHROOM HARDWARE FINISHES. This episode will make you really think about your bathroom fixtures and how they work in your bathroom decor! Now let’s get outside and set a summer table! A big thank you to Lory at Designthusiam for putting together this SUMMER ENTERTAINING BLOG TOUR. Such fabulous summer tables. Better than a magazine!!!! If you are coming from Bless’er House, welcome! I’m sure Lauren has given you so many beautiful ideas! 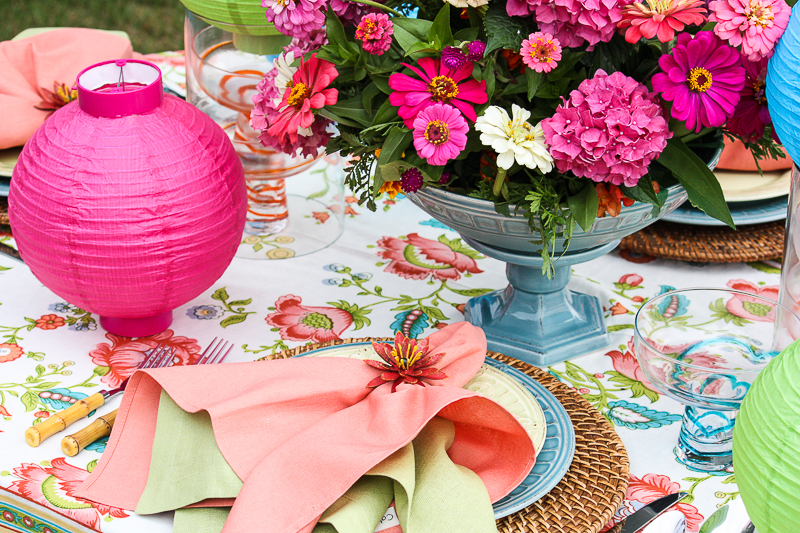 The table is set with colorful linens to match the garden flowers and lanterns! The dinner is scrumptious and easy to prepare and the music wafting through the summer evening air is Jazz! Let’s celebrate summer! Here are a few tips to make summer entertaining something special! 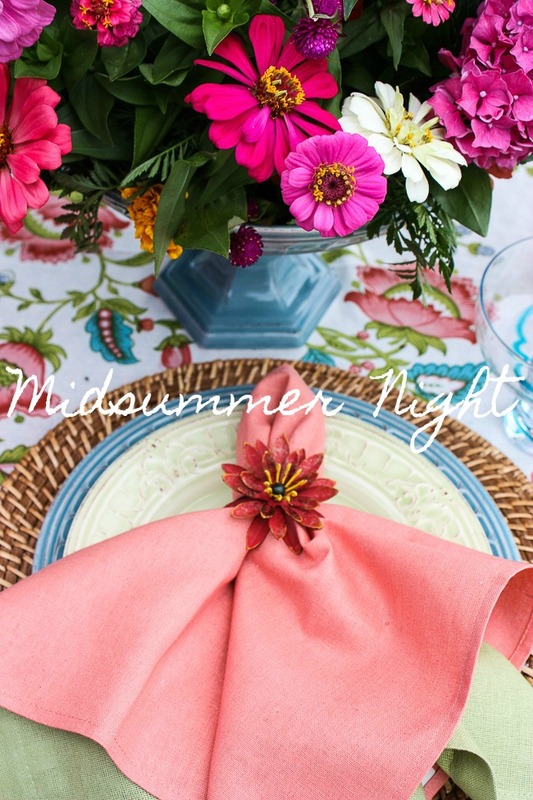 The inspiration for this dinner was the occasion of Midsummer. Although our celebration does not include a traditional bonfire it does include colorful lit lanterns! The theme was also inspired by this flowery tablecloth and the bounty of blooms from my garden! It’s much for fun to set a table when you have a theme in mind! I let colors run wild over the whole table with unabandoned brilliance! Whether china or Chinet, every place setting at the table should be carefully constructed! Layering dishes is one way to create a unique and pretty statement. I get asked all the time what to do with the dishes at each seat. That’s easy. When it’s time for dinner I whisk them all away and either use them on a buffet or plate dinner on the dinner plates and save the others for salads and desserts! Because there were so many different colors in the tablecloth I stepped outside my usual tight color palette and used layers of pretty color in the plates and napkins! 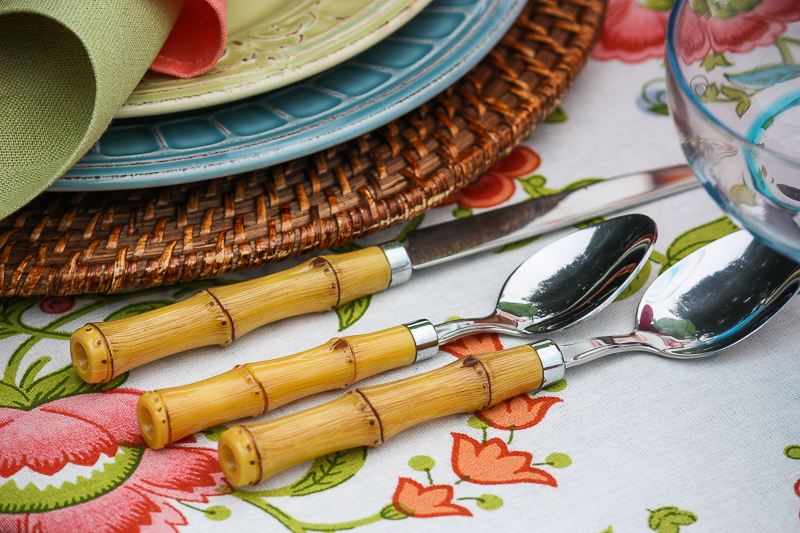 To keep each place setting from looking too much like a crayon box I grounded the settings with rattan chargers and simple bamboo handled flatware. 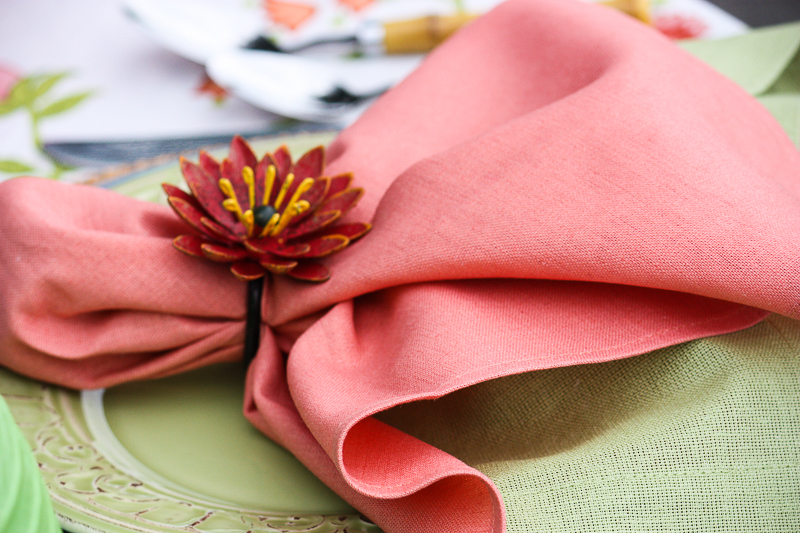 One of my favorite table setting tricks is to use double napkins and catch them up in a pretty napkin ring! 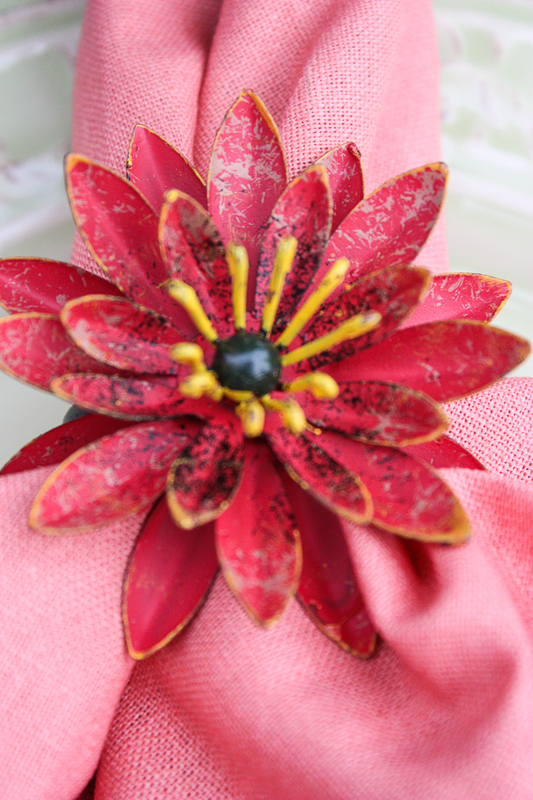 The flower on the napkin ring resembles the zinnias in the centerpiece! 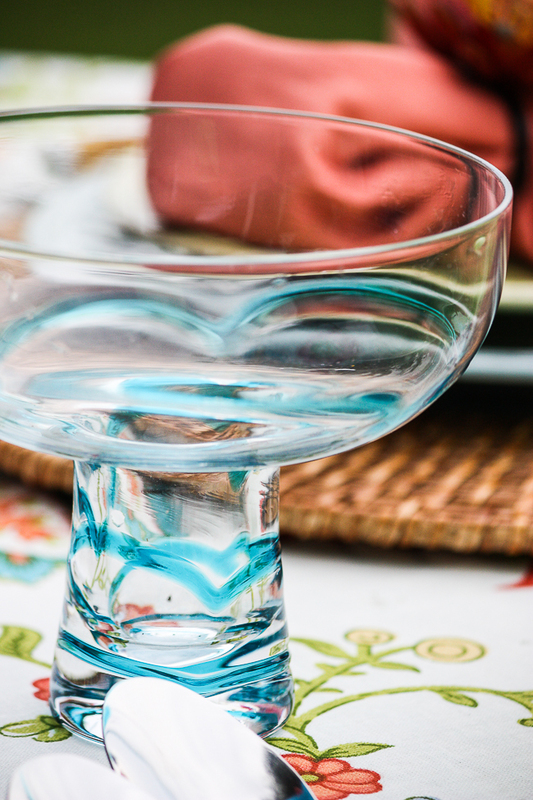 Make a signature libation for your summer dinner party! Think of one that everyone might like! It will be a memory maker! For tonight’s dinner, I’m serving A Champagne Rum Punch. Just perfect for Midsummer night! And I’m serving it in these fun swirled glasses! These are really sherbert glasses but who says you can’t serve drinks in them? Not me! 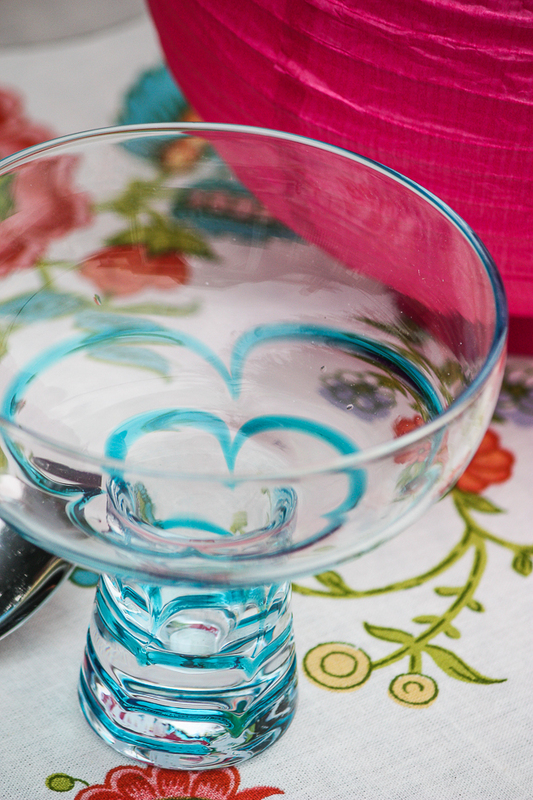 Pick a drink with your summer dinner party in mind! A summer table begs for garden flowers! Every year my garden is overcrowded with zinnias. They are such cheery, bright, colorful flowers, and my favorite! If you don’t have a garden get flowers along the roadside or at your local farmstand. Even though the evenings are longer, don’t forget candles in hurricanes or lanterns. They add lots of beauty and ambiance as the sun goes down! 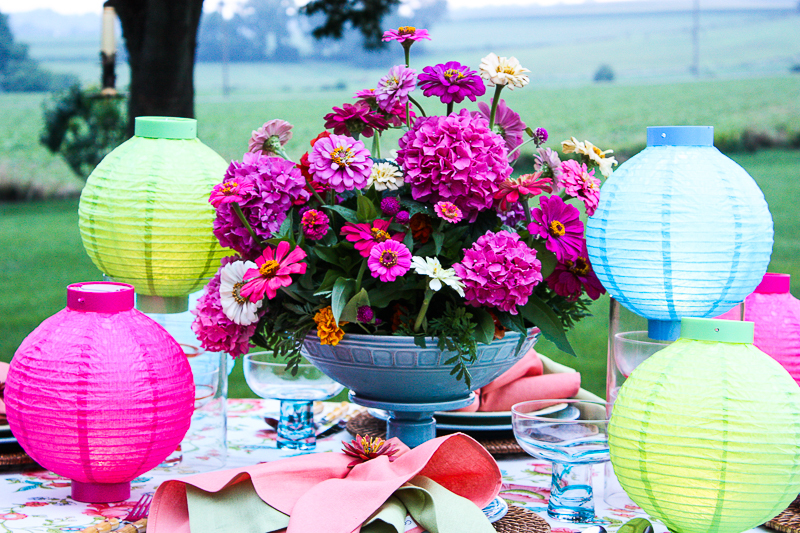 I used colorful lantern for the Midsummer table! 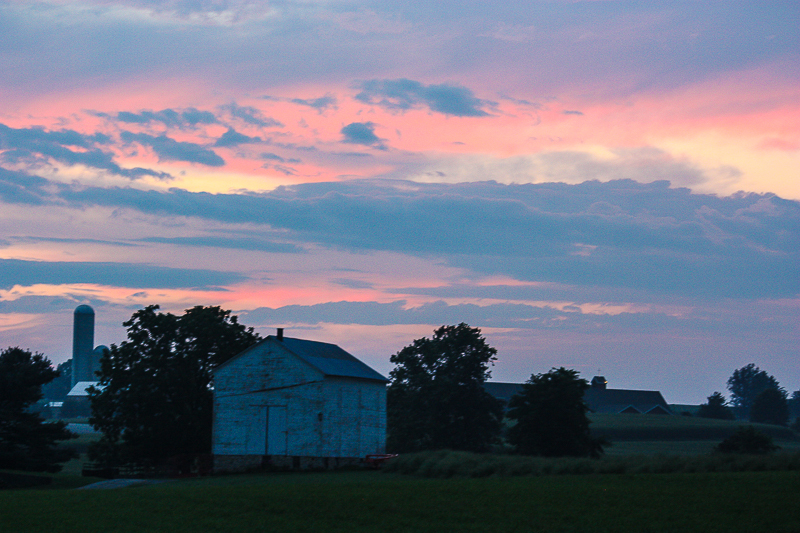 The view of the sun going down behind our neighboring farm. As the sun goes down the lantern gets brighter. Summer dining is about lingering until after dark and enjoying the great company and beautiful summer evenings! Now, I hope you will visit my sweet friend Ann at ON SUTTON PLACE. She’s next on the tour and you will love her outdoor table! 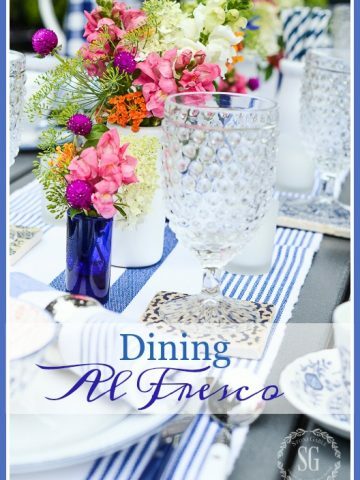 And please visit my blogging friends and their beautiful summer tables below! Such a beautiful table, Yvonne! All those flowers make it feel so decadent. Gorgeous! I love the beautiful colors Yvonne and how when the sun goes down, the paper lanterns start glowing in the same color scheme. Creative and gorgeous! Yvonne, I love how fresh and colorful this is! It is a table that is truly special; from the wood handled silver ware (love!) to the flowers. And I adore those lanterns, they add so much to the whole set-up! Colors are stunning and vibrant! Love your tablescape! Love the flowers and sherbet glasses. Oh Yvonne. I wish I could step out of this computer and sit at that beautiful colorful table. Gorgeous ?!!!!! Your tablecloth is so beautiful and cheerful. 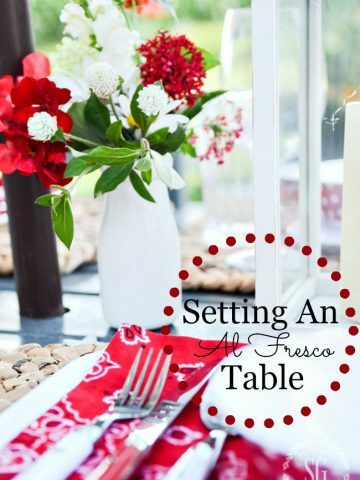 You added all the perfect touches to make a stunning table setting. I enjoyed seeing the beauty of it in the evening with the lanterns aglow. Thanks for the inspiration! That is such a happy table. All the bright colors make me smile. Your centerpiece is gorgeous. Oh my gosh Yvonne I am dying over the zinnias! I planted some and just hope they start growing and blooming. This cool weather isn’t helping much. Your table, as always, is lovely. Happy Summer! 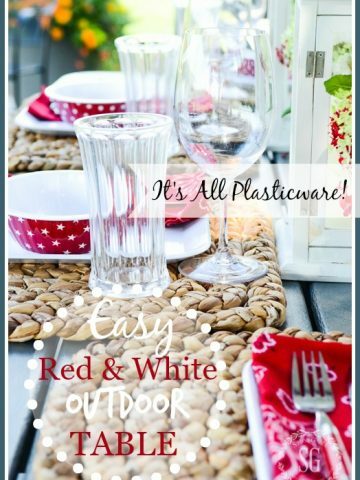 What a most beautiful table Yvonne!…the perfect summer table. Must say that I love the lanterns…how so very festive! Love the tablecloth and the flowers are the perfect compliment to it. I can just imagine your beautiful summer garden in bloom!!! Happy Summer, Happy 4th! Don’t you send out email newsletters anymore? Mine stopped coming & I enjoyed receiving them so much! Simply lovely! Those zinnias look positively glamorous! As always, Yvonne, I am drooling! Great post! I can’t get enough of your amazing tablescapes!!! Thank you, thank you, thank you!!!! Gorgeous and luscious!!! Love it ALL! What a beautiful table!! We used to have a local shop that had tables set up like yours (they used high quality faux flowers) and it did get me enthused about pretty tables!! 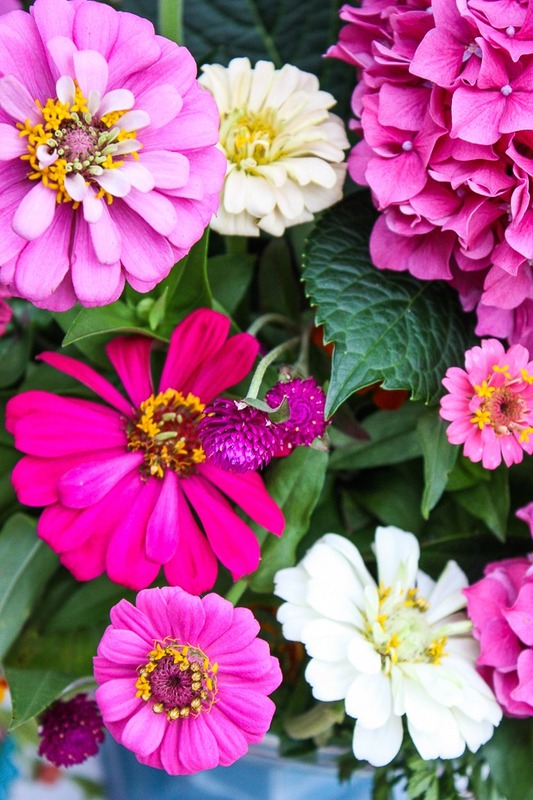 How beautiful zinnias grow and yet your spring was so far behind ours!! It all evens out by Midsummer night!! What fun!! What a beautiful table! I love the colors, the lanterns and the flowers. Wow, so beautiful, Yvonne. Love the zinnias. I haven’t seen any around here for years! 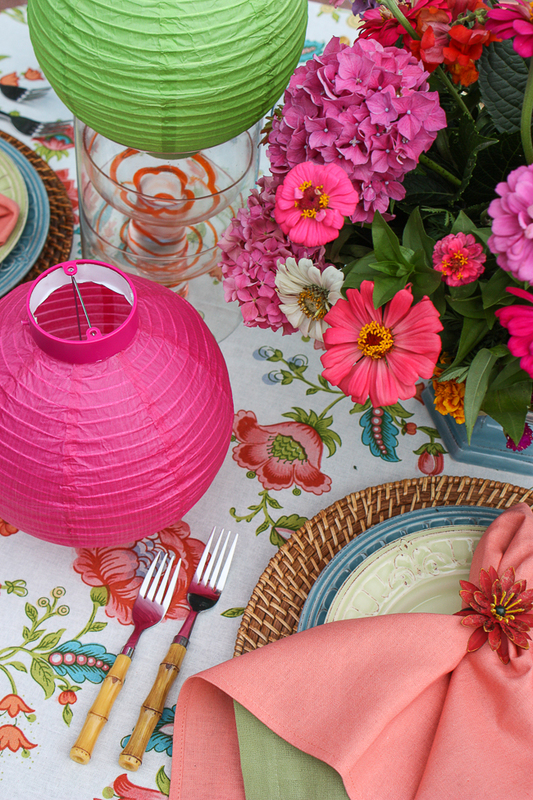 Your table looks like a celebration of summer! 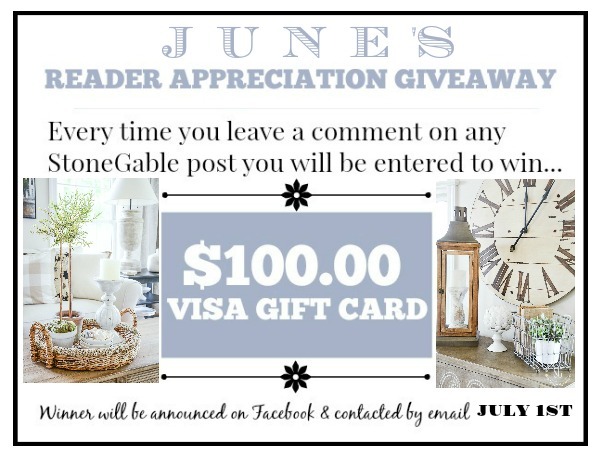 I am so happy reading your blog today! Zinnias are my favorite flowers and I can grow them almost year round in South Texas. Oh I’d have gardens and garden of them! What a beautiful table the sunset is beautiful too! What a beautiful table! Those zinnias are one of my favorites! I plant them every year! 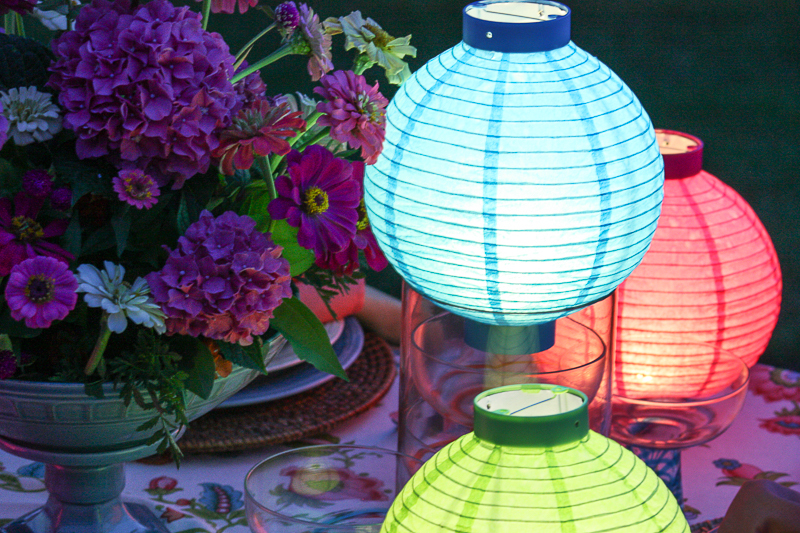 I just don’t have a place for outdoor dining?But I love the lanterns too! 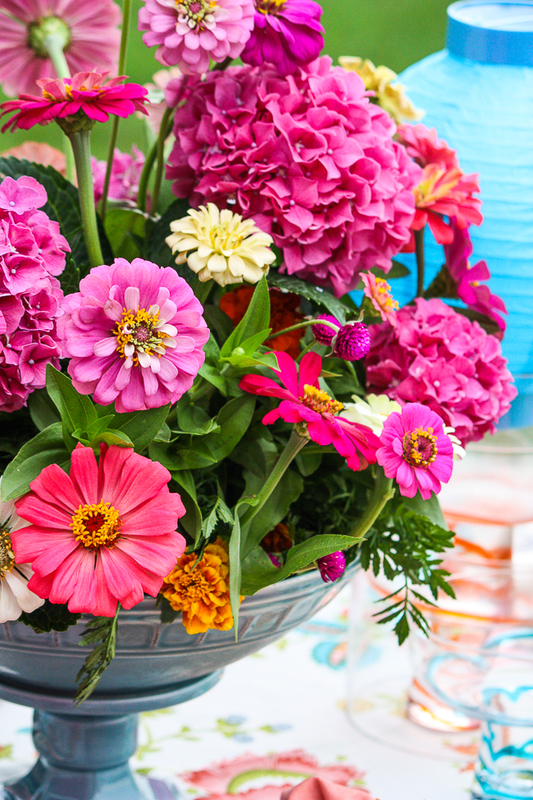 Beautiful dishes and love the decorating with Zinnias. Gorgeous colors! Everything looks so beautiful and the lanterns really make it festive. Beautiful tablescape Yvonne. 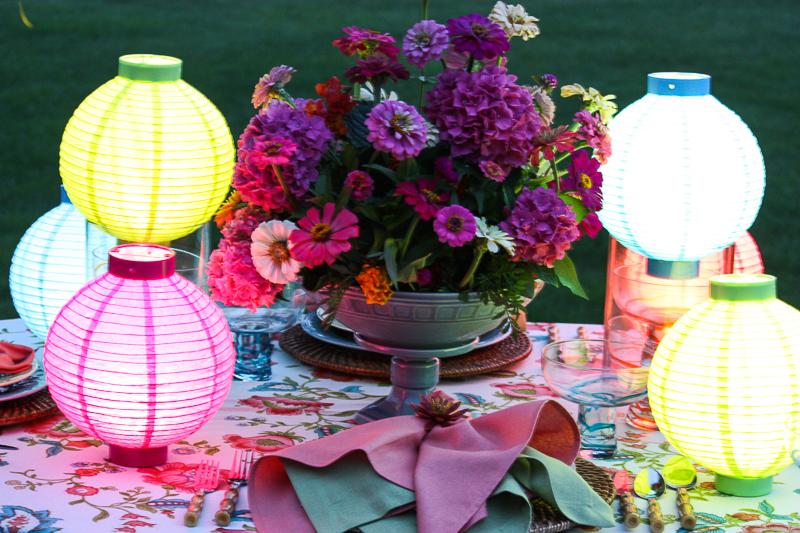 I’m loving the gorgeous floral table linens and Chinese lanterns creating a magical evening. I am visualizing a couple of scoops of sherbet for a cool summer dessert-YUM!! Beautiful table but what I really love is the pic of sunset over the barn! I love this table! I choose to get the stoneware looking melamine set from Costco this spring and have been feeling a little disappointed with my decision after seeing all the other fun patterns of melamine plate out there. You have inspired me to use colorful tablecloths and other accessories. Thank you! I’m excited about my decision now ! I’m thinking of my plates now in a new way and all the ways I can use them! Thank you! Thank you! Kimberly, What a great thought! YOU GO GIRL! I love all of the bright beautiful colors! Barely a neutral in sight! And the flowers are swoon-worthy! Are you shocked? I love bright colors but I’m more comfortable living with neutrals day to day. the flowers are so pretty and love the pic. of the sun going down. You make my heart take a deep breath – and bask in calm. Memories are made from stuff of life such as this. Perfect timing! Thank you! I am hosting a dinner on Saturday night and definitely will use your Tips. I love the pink and the green together… so I think I’ll go with that as well. Thanks so much for your tips I’m using/learning them! I always hear your words… “use a tight pallete” when I’m changing things up! Great advice! It works! The bright colors are so inviting. I love the lanterns! Your table looks amazing! What a festive table! I love all the color. This is a gorgeous summer table, Yvonne! It has so many fun elements and great colors! Where did you get the wonderful table linens- tablecloth and napkins? 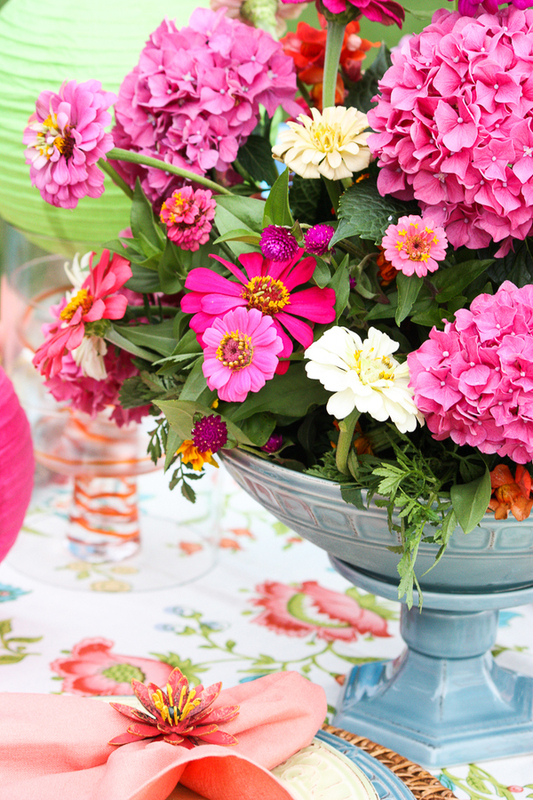 I adore your table, zinnias r a sure sign of summer!! I have to tell u, I have the same dishes, just in the reverse, “great minds, great taste”! You’ve already made me enjoy the summer holiday, cheers n blessings! ???? Beautiful table. I am having a friend for lunch next week and I will be making an extra effort with my tablescape and using tips from your post. Once again, thanks for the inspiration! That is an absolutely BEAUTIFUL table setting! I love the colors. It’s simply stunning! Happy Summer! 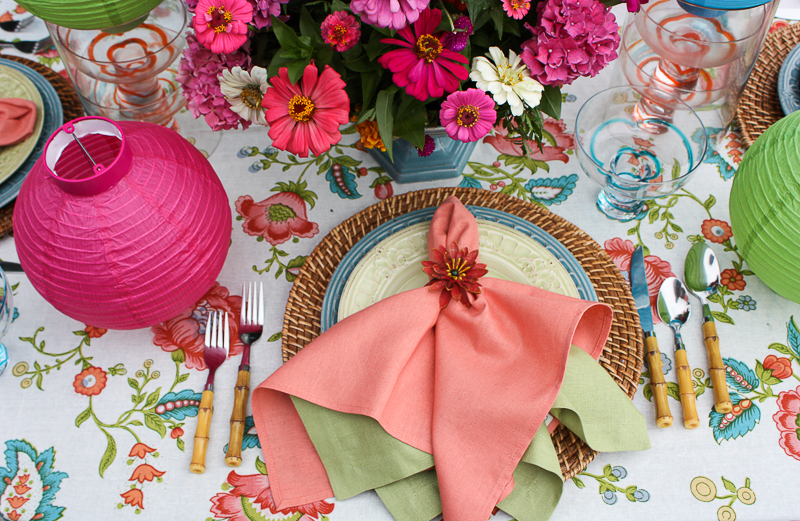 What a gorgeous table, from that playful cloth to those delicious zinnias! It just screams summer, glorious summer. What a beautiful table I would love to come for dinner. Love seeing all of the beautiful colors!!! The candlelight makes everything look so ethereal…Congratulations to you on the arrival of Emma Kate! I read about her on another post. You are well blessed, aren’t you? Beautiful! Makes me want to host a dinner! What a beautiful table! Once again, you have impressed me! Wow! What a table setting! 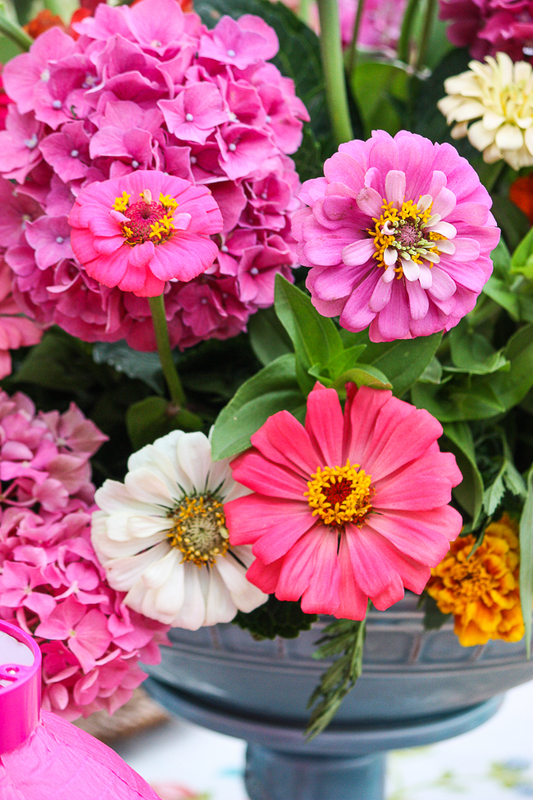 Just gorgeous and I love all the colors including those beautiful zinnias! What a wonderful table. I would love to have been there to enjoy it too. Lots of color. Thanks for sharing. Enjoy your day. 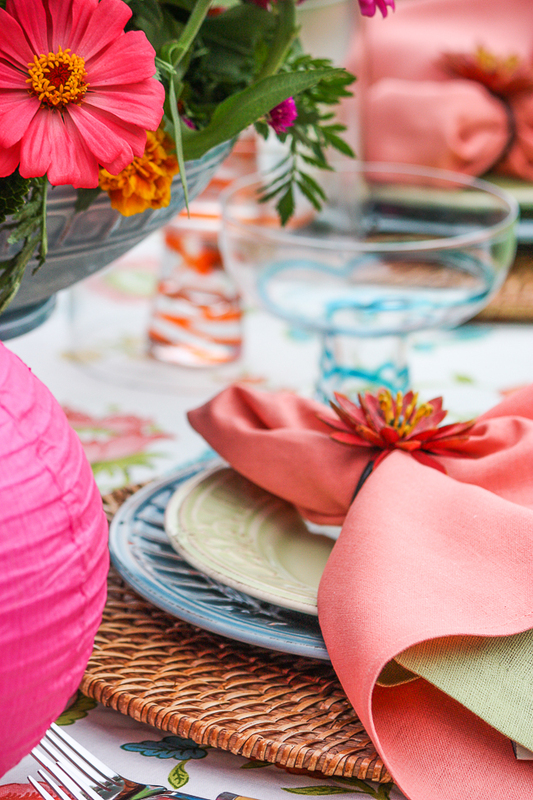 Your lovely, make you feel happy, colorful tablescape is divine! Yvonne, those are the most glorious pink hydrangeas!! Your palette is stunning!